usually with the caption: An ice-cold whisky dispenser, sometimes found in offices. (1950s). Were there really such things? It seems photoshopped to me. The caption is not true, but it's a real photo -- of a prototype. 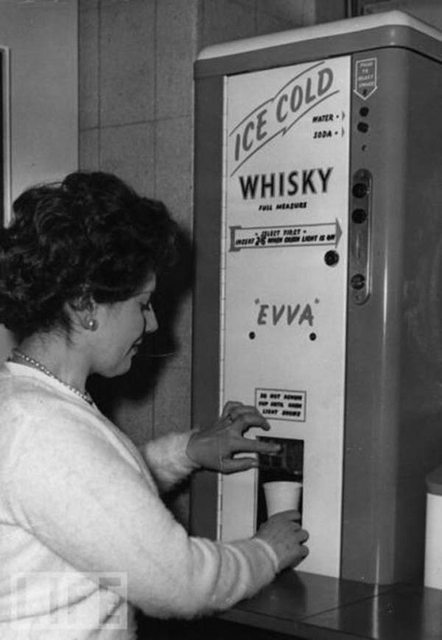 Actual caption: "At the Second Automatic Vending Exhibition in London, a woman helps herself to a vending machine-mixed whisky and soda. February 15, 1960"
There's also a photo of a beer vending machine taken in that era. As my Google Scholar search for "alcohol vending machine" came up dry, I can only guess that neither of these ever became particularly common in the West, but this kind of device that pours your beer or whisky for you is widely available in airport lounges, and you can occasionally find alcohol vending machines in Japan. Not the answer you're looking for? Browse other questions tagged united-states alcohol .